Discover the fun and excitement of making pineapple blocks! 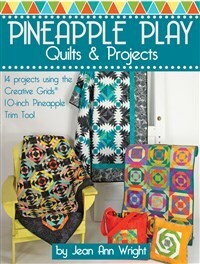 Make 14 perfect pineapple quilts, pillows, bed runners, place mats, table toppers, tote bags, and pot holders using the handy Creative Grids® 10-Inch Pineapple Trim Tool (sold separately). Just square up each round of strips as you go to create perfect 6-, 8-, or 10-inch finished blocks. No math necessary! Jean Ann Wright was editor of Quilt Magazine for 20 years. She is now a best-selling author and has designed several best-selling Creative Grids rulers. Her quilts have appeared in many magazines and she has been a featured guest on The Quilt Show.